Victor François Fétique (Mirecourt 1872 – 1933) was a prominent French archetier (bowmaker) from a family of bowmakers. Victor, son of Charles-Claude Fétique a violin maker. He learned his craft in Mirecourt with J. B. Husson, Sigisbert Fourrier Maline and Émile Miquel. [Later he went on to work for Charles Nicolas Bazin II, before joining Caressa et Français in 1901. He established his own shop in 1913 at 72 rue Myrha in Paris (8th arrondissement). Other than his son, Marcel Gaston Fétique, and his brother Jules Fétique, Claude Thomassin, Auguste Toussain, Claude Rémy, Louis Morizot, Paul Weidhaas and Andre Richaume worked for him. 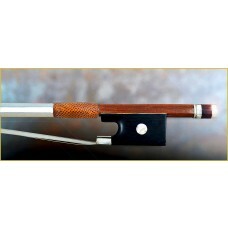 Andre Vigneron (fils) was also known to have made bows for Victor Fetique. Signed his bows "Vtor Fétique." His bows are patterned after those of François Nicolas Voirin, though less distinct. 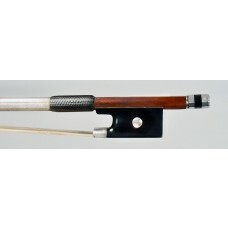 Victor Fétique and his workshop made bows for numerous other music houses, including: Collin-Mezin, Granier à Marseille, Caressa & Francais, Chanot & Chardon, J.B.L. Corolla (stamped Nadegini), Paul Jombar, Maucotel & Dechamp, Lucien Schmitt, and Alfred Vidoudez in Geneva. He was awarded for his personal production the title Meilleur Ouvrier de France (1st Craftsman of France). 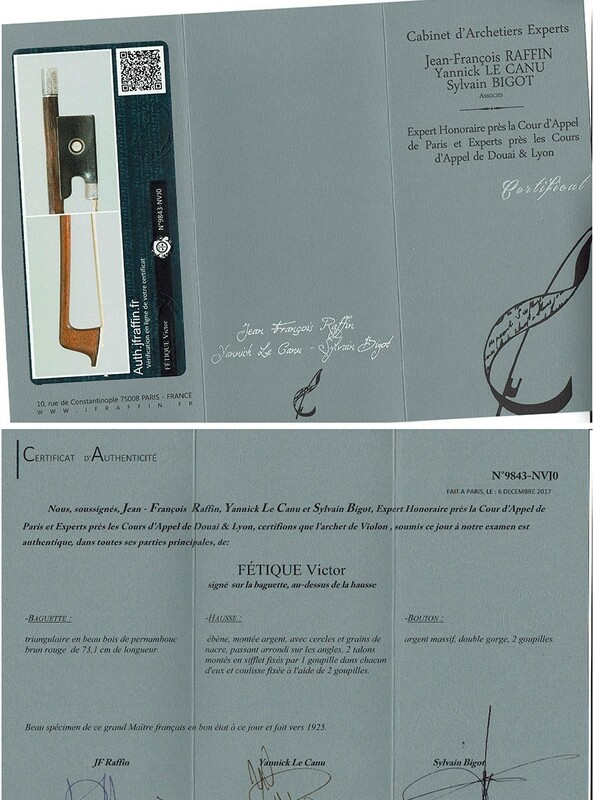 "Fetique, Victor: Very hard bows. Firm. Dense sound especially when dense wood used. Some (maybe a minority) poor examples from workshop stamped with his name. These can be short grained, for example. Very tense. 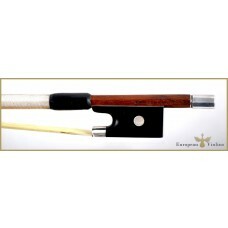 Like a German bow but far far warmer in sound. Limited flexibility. Detache works well, however. Fascinating bows; probably the hardest French bow to have been made. 'from Wikipedia). FÉTIQUE, Victor François Born 1872 Mirecourt, died 1933 Paris France. Bow maker. Son of Charles Claude Fétique. One of the great makers of the classical French tradition. Apprenticed to C. C. Husson, later with S. F. Maline, É. Miquel, and finally C. N. Bazin. Moved to Paris 1901, to work for Caressa & Français, where he was influenced by his fellow employee C. Thomassin. Established independently at 72 rue Myhra 1913. Later assisted there by his brother Jules, above, his nephew A. Richaume, and various Mirecourt outworkers, including A. Toussain, C. Remi, and L. Morizot, whose work was corrected and branded by Fétique. Title of ‘Greatest archetier in France’ conferred on him at the Paris Ex.